A century ago, Sir Halford Mackinder, the British geographer and politician credited as the father of western geopolitics, asserted that: "Who rules East Europe commands the Heartland; Who rules the Heartland commands the World Island; Who rules the World Island commands the World." Mackinder's theory captivated generations of geo-strategists who saw Eurasia as the "heartland" of the world's most populous and pivotal region. 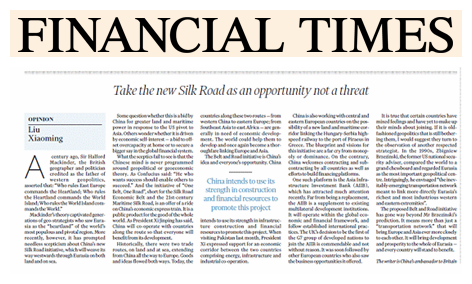 More recently, however, it has prompted needless scepticism about China's new Silk Road initiative, which will weave its way westwards through Eurasia on both land and on sea. Some question whether this is a bid by China for greater land and maritime power in response to the US pivot to Asia. Others wonder whether it is driven by economic self-interest - a bid to offset overcapacity at home or to secure a bigger say in the global financial system. What the sceptics fail to see is that the Chinese mind is never programmed around geopolitical or geoeconomic theory. As Confucius said: "He who wants success should enable others to succeed." And the initiative of "One Belt, One Road", short for the Silk Road Economic Belt and the 21st-century Maritime Silk Road, is an offer of a ride on China's economic express train. It is a public product for the good of the whole world. As President Xi Jinping has said, China will co-operate with countries along the route so that everyone will benefit from its development. Historically, there were two trade routes, on land and at sea, extending from China all the way to Europe. Goods and ideas flowed both ways. Today, the countries along these two routes - from western China to eastern Europe; from Southeast Asia to east Africa - are generally in need of economic development. The world could help them to develop and once again become a thoroughfare linking Europe and Asia. The Belt and Road initiative is China's idea and everyone's opportunity. China intends to use its strength in infrastructure construction and financial resources to promote this project. When visiting Pakistan last month, President Xi expressed support for an economic corridor between the two countries comprising energy, infrastructure and industrial co-operation. China is also working with central and eastern European countries on the possibility of a new land and maritime corridor linking the Hungary-Serbia high-speed railway to the port of Piraeus in Greece. The blueprint and visions for this initiative are a far cry from monopoly or dominance. On the contrary, China welcomes contracting and subcontracting by all countries as well as efforts to build financing platforms. One such platform is the Asia Infrastructure Investment Bank (AIIB), which has attracted much attention recently. Far from being a replacement, the AIIB is a supplement to existing multilateral development institutions. It will operate within the global economic and financial framework, and follow established international practices. The UK's decision to be the first of the G7 group of developed nations to join the AIIB is commendable and not without reason. It was soon followed by other European countries who also saw the business opportunities it offered. It is true that certain countries have mixed feelings and have yet to make up their minds about joining. If it is old-fashioned geopolitics that is still bothering them, I would suggest they turn to the observation of another respected strategist. In the 1990s, Zbigniew Brzezinski, the former US national security adviser, compared the world to a grand chessboard and regarded Eurasia as the most important geopolitical centre. Intriguingly, he envisaged "the inevitably emerging transportation network meant to link more directly Eurasia's richest and most industrious western and eastern extremities". 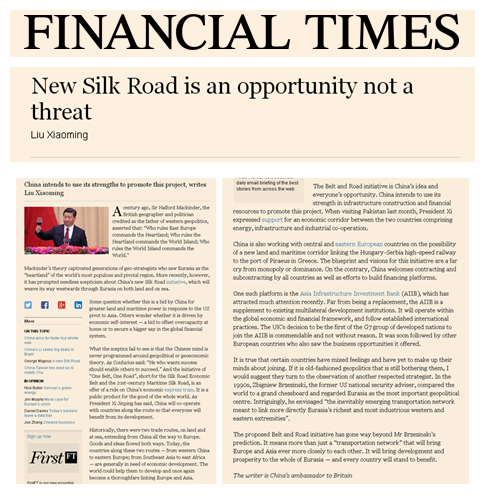 The proposed Belt and Road initiative has gone way beyond Mr Brzezinski's prediction. It means more than just a "transportation network" that will bring Europe and Asia ever more closely to each other. It will bring development and prosperity to the whole of Eurasia - and every country will stand to benefit.